It's nearing the end of the school year, and parents across the nation are once again looking for a unique gift to show gratitude to their children's teachers. The economy being what it is, budgets are tight. Undoubtedly, the last thing teachers need is another apple-related knick knack. So, here is a reasonably-priced, easily personalized, and highly useful token of gratitude. Made of linen, these beautiful cutwork bookmarks come in a convenient dozen-pack. 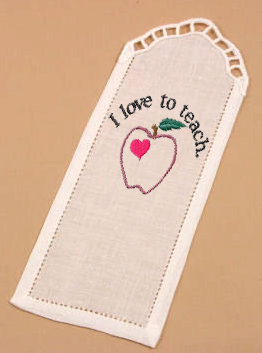 Just add a single monogram or, in this case, an apple-themed embroidery design, and it is a gift that your child's teacher will actually use and they probably won't have another one like it. Press well before embroidery. Light starch also helps keep linen crisp. Embroidery designs may need to be slightly reduced to fit the bookmark's width. Use a self-adhesive stabilizer for easy no-hooping hooping. Take it to the next level with a gift card to a local lunch spot, book store, or office supply. If you can read this, you really should thank a teacher!